This year marks three decades of Day of Champions. Our annual family event will take place on Thursday 22nd August, once again kick-starting the British Grand Prix. It's a chance to get up close to the biggest stars of motorcycle racing and have a cracking day out with friends and family. There's always a tons to keep you entertained. We'll have the Classic Bike Village showcasing beautiful machines of the past, and our ride in where you can arrive at the event in style - cruising through the English countryside in convoy before taking to the track at Silverstone. There will be lots of memorabilia for sale, live entertainment and, of course, our world famous auction with your favourite riders giving you the chance to bid on unique items. Those with paddock access will once again have the opportunity to be at the very heart of the action*. 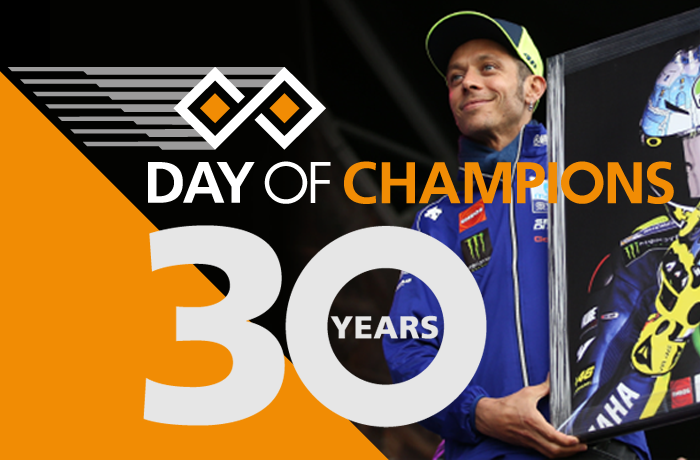 And to celebrate 30 years of Day of Champions, Dorna have generously given us more paddock tickets than ever this year so more of you can get the thrill of being behind the scenes at MotoGP™. More coming soon. Watch this space for info about special entertainment and surprises that we'll be putting on for this landmark year. Tickets go on sale 2 May, at 10 am. * Paddock tickets usually sell out within minutes, so if you want them be sure to be on the phone at 10am sharp. We have more this year to celebrate our special year but we can't promise they won't sell out just as fast! * Ride-in tickets and general admission tickets for all ages will also be on sale. General admission prices start at £20. * Tickets will be available via phone and the website 0344 3750 740 or www.silverstone.co.uk/events/day-of-champions (not available until 2 May). Two Wheels News subscribers will be the first to know about all Day of Champions news - sign up here. *From 11am until 3pm when the gates will close.